Rustic self catering chalet house sleeps 10 in 4 bedrooms (1 is a mezzanine). 3 star rated by the French Tourist Board 2012. Ski Orelle 2300m-3250m accessed by the ski gondola lift '3 vallées Express' from the village taking you up to 2300m and then continue up to 3250m for 'guaranteed snow'. In the summer walking trails start next to the chalet + a great variety of cycling routes including theTour de France's famous Col du Galibier plus lots of easier ones! Orelle offers the advantage of a quiet small village atmosphere (400 inhabitants) with great walks and excursion possibilities in the summer, plus in the winter the easy direct ski access to Val Thorens (1800-3200m) the 3 valleys ski extravaganza! Easy airport access from Lyon 2 hours & Turin in Italy 95 mins (via the Frejus tunnel). Within the village of Orelle. Mauro and Alison have been living in France for almost 13 years. They own three quite unique and individual properties, Manoir Le Cosquer and 45 Rue De La Rive in Brittany and Chaletski3v in the Alps. Each property has been specially chosen to offer you, our clients, a good selection of quality holiday options. Before moving to France Alison & Mauro ran a language school in Cheltenham teaching English to foreign students and foreign languages to English students. After almost 10 years and two small children later they decided it was time for a change. They loved France, had a small holiday home near to Dinard and so decided to start a new adventure in France before the kids were of school age. They sold up in England in 2001 and moved to France in 2002. We bought Chaletski3v because it is very well placed in the centre of the small hamlet of Orelle which links directly to Val Thorens via the 3 Vallées Express gondola. This suited us as we envisaged that our future clients would be families and groups of friends who love skiing but do not want to stay in a developed resort, and like us, preferring to do their 'own thing'. The chalet is far away from the crowds but only 1 kilometre away from the 3 Vallées Express gondola and in the village centre-15 minutes on the lift & you will be skiing in probably the best ski area in Europe with 'guaranteed' snow! The house is also very spacious and welcoming and so you will really feel at home. There are two lounges and 4 bedrooms so everyone can have their own 'space'. Great summer walks from the doorstep plus wonderful excursion possibilities to national parks, mountain lakes and great biking. The property is self catering and has a separate spacious dining room where you can all enjoy your favorite food & recap on the days skiing! Added bonus are the Raclette machines. You can buy any provisions you may need locally, and you can buy fresh bread from the grocery store. The ski room adds value to your holiday experience as you can put your skis away and remove boots without trudging them through the house. The rental price represents very good value compared to staying in the more well known and developed resorts - every little helps! Prices start from as little as 460 euros for up to 10 people sharing. For non skiers why not try the local spa facilities or drive into Italy for a days shopping! 2 shower rooms with wc, shower and basin in each. Orelle forms part of the 3 vallées network and is often referred to as the 4th valley offering 600 kilometers of pistes, snow parks, modern equipment and lift system. Fabulous on & off-piste skiing. Ideally suited for all intermediate levels and above. Although determined beginners can also succeed, this resort is not really resuited to complete beginners. Orelle has some of the highest skiing in the 3 vallées 2350 - 3230m - Orelle has its own network of runs for all levels and has more or less guaranteed snow. But the fun really starts by heading over to Val Thorens and the 3 valléés! Gondola lift from Orelle village - 1 kilometre from the chalet, free parking, shuttle bus during school holidays. Lift takes 15 minutes to get to the skiing at 2350m and one lift over to Val Thorens. Orelle / Val-Thorens 140km of slopes. 100% of the ski area above 1800 m. long slopes. 30 ski lifts. 68 slopes : 8 green, 27 blue, 25 red and 8 black. 3 Valléés - 600km of listed runs! Notes on accommodation: Electric heating throughout. Towels and sheets at 15 euros per person per week. Full free WIFI access in chalet. Outside: Small terrace and shared courtyard. Small first floor balcony. Utility Room: Washing machine. Cleaning / Towels / Linen / Maid service: Towels & sheets can be provided for a small supplement. Winter electricity allowance with supplement for extra usage. See owners conditions Other: Ski room in the winter and cycle room in the summer for storing skis and bikes. Not a ski in ski out village - but very convenient and easy access from the village to the pistes. A wonderful property with such character, it looks tiny from the outside, but once inside the building and number of rooms just get bigger it's like a Tardis. There is so many rooms, beds, sofas and space! The wifi is amazing throughout the house. Everything you'd need in a home is available, it's warm and bathrooms are great. It's a good distance from the ski lifts, shops and amenities so a car is highly recommended, but worth it for the quiet area. The meet and great was wonderful, we managed with our broken french, they did a super job of making us feel welcome. It was very clean, I would highly recommend to a family who want the skiing experience. It was an excellent experience - a perfect holiday with family and friends. Perfect location, facilities, cozy homely environment. You will find everything you need in this property. It is clean and renovated. Will definitely come back again! Great ski holiday - Orelle is a high resort and links into the 3 valleys via Val Thorens - easy access and more or less guaranteed snow. A lovely house style chalet with oodles of space, wifi kept the children happy! Orelle is a sleepy quiet village and suits people who don't want a 'typical' ski resort. We loved skiing all day then taking the lift back to the village, having a couple of drinks in the local bar and then getting back to the chalet and planning the evening meal all together. Plenty of free parking in the village, there is a free bus service during the school holiday periods and you have to book it at the tourist office - we preferred to drive the 1 km down the hill to avoid waiting etc and this really isn't a problem. Would recommend!! We are regulars to Orelle and enjoyed another fab ski holiday with friends. 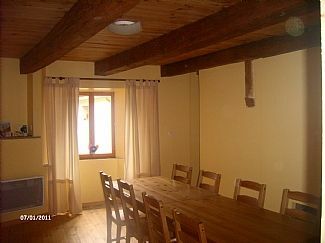 A spacious and well equipped ski chalet that is great for a large group of family and friends. Its easy to drive to rather than driving too high into the mountain roads, yet its only 5 mins drive to the ski lift straight into the high resort slopes for gauranteed great snow and ski-ing. Now we have discovered its a regular annual pilgrimage - looking forward to next years group! Très bon week-end de retrouvailles! Le chalet était l'endroit parfait pour se retrouver entre amis, il est très fonctionnel, Yvonne et Jean Marie nous ont merveilleusement bien accueillis et l'épicerie du coin nous a permis d'organiser le plus simplement du monde une belle soirée raclette! La météo était au rendez vous et la glisse un réel plaisir. Plus - walking trails from the chalet. Cycling - Some fabulous mountain routes including the famous Col Du Galibier, and lac Cenis near to Orelle. 'National Parks' Parc de la Vanoise nearby - see the marmottes! Via Ferrata near to Modane. Easy access with short transfer times, situated In the Maurienne valley 10 mins from the motorway (St Michel de Maurienne), 60 minutes from Chambery & 90 minutes from Grenoble and Turin. 2 hours from Lyon & Geneva. The best option for 'getting there' is to fly drive or drive. A car is essential. The bigger village of St Michel de Maurienne is 5 minutes away for your big shop, banks etc. Nearest towns are Modane (10 minutes by car) and St Jean De Maurienne (15 minutes). Visit Italy - Bardonecchia (25 minutes), Susa (40) minutes or Turin (75 minutes). Small supermarket in Orelle, bigger one in St Michel (next village to Orelle) where you will also find a bank, bar/cafes, pharmacy, newsagent and doctors. One restaurant in Orelle others nearby in Modane (good Italian), St Michel, and St Jean De Maurienne. Two bars in Orelle and others in nearby villages. Spa complex in Orelle - sauna, jacuzzi, Turkish bath, pool, bar and restaurant. Booking Notes: Prices are per week for up to 10 people sharing - self catering. Full payment upon booking.Breakages deposit €400 on arrival. Returned at end of stay after any deductions. Electricity allowance included - extra units payable at the end of the stay at 15 centimes per kwh. Final cleaning is not included and the property should be left clean and tidy. Final cleaning can be arranged by contacting the owners €45 payable on site. Even when final cleaning is paid all rubbish and left over food and recycling must be removed from the property and disposed of in the communal bins. Extras costs will be charged if rubbish is not cleared away. Changeover Day: Saturday or by prior arrangement. Notes on prices: Prices are euros per week for up to 10 sharing on a self catering basis. Optional towels/sheets at 15 euros per person per week. Electricity supplement may apply over and above allocated amount. Taxe de sejour (local tax) 7 euros per person per week (children exempt). Pets allowed on request with supplement. Our local representative will check you in and out.